You want your home to have stunning flooring, that is durable and hold it's value well, but you may not be to purchase such high-end floor options as hardwood flooring or porcelain tile. Resilient flooring is an excellent alternative because it can be manufactured to resemble these other flooring materials. It is also much more affordable, particularly if you make your purchase with our reputable flooring store. Resilient flooring is perfect for homeowners with children and/or pets. It is scratch resistant, spill proof, and more. Our expansive flooring company carries all variety of resilient flooring options. 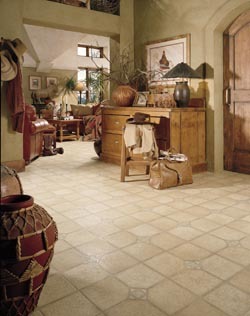 We maintain the most competitive rates on luxury vinyl tile and luxury sheet vinyl. You can also get a great deal on vinyl plank and wood vinyl plank flooring. Right now, we are offering $100 off any flooring purchase. 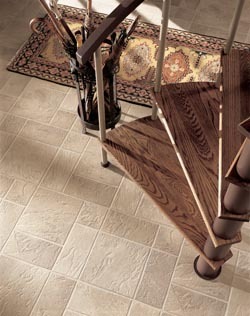 If you are unsure what type of floors you want, our knowledgeable staff is always willing to help. We can lend our expertise to help you decide on new floors that meet your aesthetic, budget, and functional needs. For high traffic areas that include pets and children, vinyl plank floors are a stylish, durable, and budget-friendly choice. The design flexibility of resilient flooring makes it an ideal fit for any room. It can mimic the appearance of different hardwood species or even natural stones such as shale and marble. You can further customize the appearance of your new flooring by choosing the shape, color, and design pattern. Even though it can look like stone, vinyl plank flooring provides a softer surface, making it comfortable to walk on even if you are barefoot. When you purchase new flooring, you want to make sure you get the most out of it. Whether you decided wood vinyl plank or luxury vinyl tile, our flooring technicians have the experience and equipment to perform the installation flawlessly. The first thing we do before any installation is measure the room where the installation is taking place. We will come to your home and measure the rooms or hallways at absolutely no cost to you. Once we finish measuring, we will provide you with a free estimate. The actual installation process can be scheduled around your preferred day and time. Our flooring experts bring everything required to secure the resilient flooring to the subfloor and ensure that it fits the perimeter of the room seamlessly. If you want your new floors to look their best and last as long as possible, allow us to handle the flooring installation. There are a number of different sizes and gloss level options of luxury vinyl tile at our showroom. With this affordable alternative to stone, ceramic, or hardwood, we are sure you can find the ideal fit for your lifestyle, performance, and budget requirements. Our resilient flooring is durable and long lasting it is. Manufacturers use a combination of the latest polymer materials to create an incredibly strong substance that they can mold into sheets, planks, and tiles. The material has the strength to endure heavy foot traffic, and it is water resistant, making it a great choice for kitchens and bathrooms. The versatility and affordability of resilient flooring is why it continues to grow in popularity. Contact us today to request a free estimate on any type of resilient flooring option. We proudly serve Decatur, Forsyth, Mt. Zion, Macon, and Solomon, Illinois.